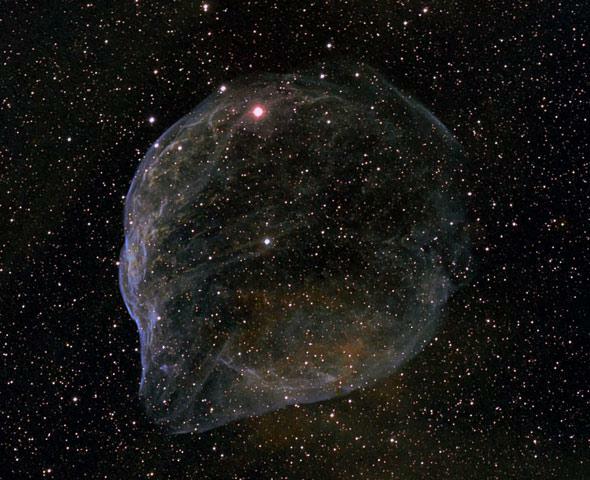 Sharpless 2-308: A cosmic bubble from a galactic monster. A Cosmic Bubble That’ll Soon Pop. Hard. Sometimes, I’m pretty happy our planet circles a relatively calm, normal star. Because when I look at stars like EZ Canis Majoris (aka WR 6, HR 2583, HD 50896, and other aliases), I think that things around here could be a lot less conducive for life. The nebula Sharpless 2-308 around the violently unstable star EZ Canis Majoris. Click to embiggen. Pretty, isn’t it? But the beauty belies a true monster. This photo was taken by Jeff Husted, an astrophotographer who observes in the western U.S. It shows the star EZ CMa (for short), the star just left of center of that ethereal glowing bubble of gas. It’s what’s called a Wolf-Rayet star, one of the more terrifying beasts in the galaxy’s menagerie. It’s a star that started out life with more than 40 times the mass of the Sun, which made it super-hot and extraordinarily luminous. Stars like that can be hundreds of thousands of times as bright as the Sun! A planet orbiting it as close as the Earth to the Sun would be cooked to a vapor pretty rapidly. Wolf-Rayet stars lead short, violent lives. They’re so bright that pressure from light itself can blow material off the surface, leading to strong winds of gas blasting out from the star. Some time ago, EZ CMa blew out just such a wind, which expanded away from the star in a roughly spherical manner. It slammed into the gas floating in between the stars, sweeping it up and heating it, creating that magnificent bubble. The gas cloud itself is called Sharpless 2-308. It’s when I look at the numbers that this starts to make my brain tingle. The distance to EZ CMa is difficult to determine, but it’s most likely about 5,000 light years away. Even from that stunning distance—that’s 50 quadrillion kilometers (30 quadrillion miles)—the star is almost bright enough to be seen with the naked eye. If the Sun were that far away, you’d need a pretty good telescope to see it at all. In the sky, as seen from Earth, Sharpless 2-308 is bigger than the full Moon. That means it must be a staggering 60 light years across. That’s huge. When a star like the Sun dies, it might blow a bubble (called a planetary nebula) a couple of light years across. The wind from EZ CMa is more like a cosmic gale. The structure of the bubble is interesting. It’s brighter on one side than the other, and you may notice the star is off-center in that direction as well. That’s probably not a coincidence. I suspect the star is moving rapidly in space toward the left in this photo, and so the speed of its wind is faster in this direction as felt by the gas around it. That means the gas piles up more in that direction, making it look brighter. The weird blister next to the bright section is probably a blowout, a place where the outside gas is thinner. Like a weak spot on a balloon, the wind from the star pushed through there more easily, expanding and rupturing it. Essentially the bubble has popped there, the gas from the star poking through the shell of gas piled up around it. We see this sometimes in the rapidly expanding debris in a supernova explosion, too. When I contacted Husted about his photo, he asked me an interesting question: Are there any stars inside that bubble? The answer is emphatically yes. In our local neighborhood, stars are about 4 light years apart on average. EZ CMa is located in a region with a much denser stellar population, and with the bubble being dozens of light years across, it must enclose hundreds of stars. Thousands. It’s a weird thought, made even more bizarre to think that from their viewpoint, the bubble might be almost invisible! To them, it would be spread out over the entire sky, its light diluted almost to nothing. Some of those tendrils and filament might be visible in deep exposures, but I suspect the overall bubble might go unnoticed to any alien astronomers. Unless they were clever. The gas also emits X-rays, and is actually pretty luminous: In X-rays alone, it gives off as much energy as our Sun does at all wavelengths! If the aliens had X-ray telescopes, they might notice they’re immersed in the glow of Sharpless 2-308. And here’s the kicker to this whole thing: EZ CMa doesn’t have long to live. Soon enough—in some thousands of years, more or less— it’ll explode. That’s what Wolf-Rayet stars do. And when it does it’ll be a huge explosion, blasting out as much energy in a few weeks as the Sun will over its entire 10-billion-year lifetime. At 5,000 light years distant it’s too far to hurt us, but wow, what a sight that will be. It’ll easily outshine Venus in our night sky, and be visible to telescopes all over (and above) Earth. It would be a big boon to astronomy, to see such a thing … and a reminder to everyone, once again, that with our own relatively quiet and even-tempered Sun, we have it pretty good.